He implicitly believes a big bang origin for the universe 14 billion years ago, and says that there are some questions for which we may not get answers. Carroll talks about science as what we can measure experimentally but then in regards to the alleged big bang he appeals to faith, using the big bang model (theory not experimental results) to test the big bang model (theory). This is common practice among astronomers. He admits this in regards to measurement of the alleged expansion of the universe. Figure 1: Light from distant galaxies shows spectral like shifted towards the red end of the spectrum. Hence they are labelled ‘redshifted’. Only spectral lines are measured, not recession speeds. Secondly the big bang model is assumed by applying the assumption that galaxies at different redshifts represent the state of the Universe at past epochs classifies by those redshifts. This is the cosmological principle in application. It states that there are no special places in the universe and all locations at the same epoch of time look the same. Thus you can use galaxies at any redshift as representative of the state of the whole universe at that time. But the latter can only be assumed, without proof. In fact, cosmology itself is an historical science (at best) and more akin to trying to reconstruct the history of the rocks from sedimentary layers or past life from the fossils buried in those rocks. 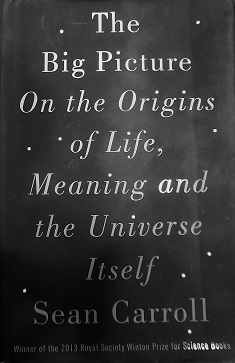 At the end of the chapter on our universe he opines about our existence and purpose. All the glory to the universe! Or so it would seem. This is what the book is essentially preaching. Considering how these atheist apologists operate, not only Carroll, but also Krauss, Tyson, Hawking, Dawkins and others, there is often really little effort focused on real operational science but more on presenting unprovable-historical-science stories dressed up as real science. The tone of this book, though at times the author admits to the shortcomings of our current knowledge, is not critical of the evolutionary stories, but only of minor details that yet need to be filled in. To state to a general audience that velocities of galaxies are measured (for example) without qualification, because it fits into the story-line, is tantamount to being deceptive. This book like many others along the same line attempts to sell a message—a philosophical worldview—dressed up as science. Nowhere does the author address the impossibility of doing real science on the Universe, nor does he explain the limitations of cosmological investigations. The following paragraphs, excerpted from a 2007 article published in the prestigious journal Science, include quotes from three well-known cosmologists.2 Square brackets are my insertions. Researchers have measured the temperature variations in the CMB [Cosmic Microwave Background radiation] so precisely that the biggest uncertainty now stems from the fact that we see the microwave sky for only one Hubble volume [i.e. only one possible observable universe], an uncertainty called cosmic variance. ‘We’ve done the measurement,’ [Charles] Bennett says. In the chapter titled “Time’s Arrow” he states that the arrow of time seen in human aging and in the evolution of the big bang universe are “intimately related”. The notion of purpose is discarded in favour of just everything that happens, including aging and our memories, are the result of the big bang. It reads like worship of the big bang. It is the reason for our existence and must be given due credit, even credit for the existence of time itself. He discusses the special condition that the Universe allegedly started in, that is in a low state of entropy from which entropy (or disorder) has ever since increased as a function of time. He states that this gave rise to the well-known “thermodynamic” arrow of time. Later he credits this initial low entropy state and subsequent progression of expansion and increasing entropy as the cause for growth in complexity everywhere and even the origin of life itself. Thus Carroll ultimately appeals to a ‘god of the gaps’. And his god seems to be the big bang itself. But the evidence is better interpreted as being consistent with a uniquely created Universe. The Universe was created by the self-existent One, the eternal I AM, who is outside of time. He created the Universe in an initial low entropy state (not in a big bang) and created all life within it. The Creator is the First Cause. The initial low entropy state implies a beginning. Anything that has a beginning has a first cause. Only an eternal uncreated being can be that first cause and He is God. Click here for Part 4 of this review. Marmet, L., On the Interpretation of Red-Shifts: A Quantitative Comparison of Red-Shift Mechanisms II, marmet.org, February 29, 2016. Cho, A., A singular conundrum: How odd is our universe? Science 317:1848–1850, September 28, 2007. OPERATIONAL AND HISTORICAL SCIENCE: WHAT ARE THEY?